This March Apple finally detailed the Watch, its features, its specs, pricing and availability. By the end of the event many of the people watching or reading about it were left wondering what happened? Do we really need this watch? Every device has its pros and cons, there is no denying that. 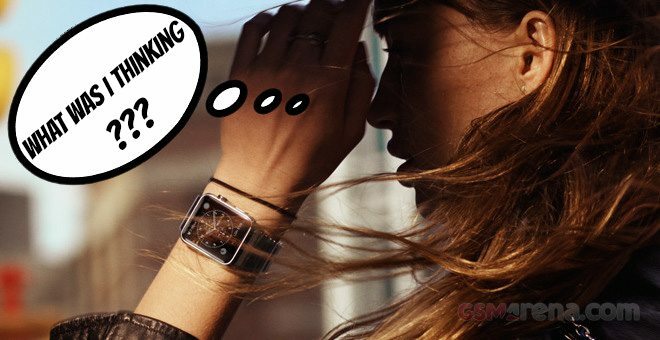 We know what we are looking into a smartphone, so let’s try to find out what we should be looking for into a smartwatch, shall we? The smartwatches and smartbands became popular really fast, mostly because of the fitness apps and companion features. They allowed easy tracking of your activity, sleep, food habits and eventually a band or a watch could have become a valuable fitness companion. That’s cool, right? So, one of the first thing a device of such kind should do very well is help you train and track your sport activities. Notifications at a glance is just a must for a smartwatch – your companion device should be able to show you all your notifications and if you could interact somehow with those, it would be even better. Battery life is crucial for tracking devices, so the watch or the band should be properly designed and optimized for satisfactory endurance. Protection – if you are taking your watch/band out, then it should be scratch-resistant, dust-tight and water-proof. You will be sweating, you will wash your hands, you will run or walk in the rain. No compromises allowed. Customization is important – you should be able to make the gadget yours – custom bands and custom watchfaces are a must. Apps – a smartwatch should be able to support third-party apps, which will allow for further expansion of its functionality. Depending on your goals, you may not need all of these features. For example – if you are going for a Pebble – you’ll get everything but less focus on sport due to the lack of proper sensors. It is priced accordingly to its features and sure won’t let you down. Now, let’s talk Apple Watch. Tim Cook and Jony Ive sure love the Watch because of its design, sapphire glass and default bands variety and they passed the love to the public. Apple nailed the customization of the Watch – you can get it in two different sizes, there are plenty of bands, lots of watchfaces to choose from, you can even opt for a pure gold edition. Beautiful design, attention to detail, excellent customization – Apple Watch seemed to have it all. The Apple Watch software is very good, or so it appeared – easy to interact, with rich app repository at launch. I have my doubts about the crown scrolling, but we are yet to see it in real action. The Watch will be able to control your iPhone very easy though, you can even make calls and interact with Siri. So far, so good. Now what about sport? It has motion processor, there is a heart-rate sensor. Apple’s fitness package is integrated with the Health app and looks promising. It can track your sleep, follow your activity through the day. But ultimately it fails at both. First Apple Watch is not water and dust tight. And second – it has less than a day of battery life. Apple Watch can’t track your sleep because it will be hooked up to a charger. With less than 18 hours of battery life for the 42mm model, and I am scared to even ask about the 38mm endurance, the Watch completely fails at being your companion whenever. Worse still, the Watch also fails to be with you wherever – it isn’t water-proof, just splash resistant. This means you can run in the (light) rain, but you can’t take it to the pool, you can’t properly wash your hands wearing it, and oh, you aren’t even supposed to sweat that much. Apple says it is able to withhold liquid damage from the latter, but are you willing to risk it? The warranty doesn’t cover sweat damage, you know. Update: Here is the official quote from Apple’s official webpage, added there on March 10. Until March 10 there was nothing on the water protection whatsoever. As much as I think about it, the Apple Watch fails to do a lot it is advertised for because of its lack of protection and poor battery life. Most of you charge their phones every day or two. And I know it feels annoying. Now imagine you have another device you must charge every single day. Every day until you get tired of it. Plus your phone, of course. And your tablet? Do you have a laptop? Right. I know some will say it’s a piece of electronics and may want to forgive water-proof omission. It’s a WATCH! And a fitness tracker! I don’t know what Apple was thinking! Didn’t Tag Heuer ex-CEO tell Apple what it takes to make a watch? If not, then what’s the point of having him at the company. And finally, the Apple Watch is insanely expensive. It costs almost as much as an iPhone 6. Or if you live in the USA – may be more. The ‘cheapest’ €400/450 model doesn’t even feature sapphire glass against scratches. While the most expensive $10,000 gold Watch Edition comes by default with a cheap rubber band, as all other editions. Call me nuts, but when you are buying something that expensive at least you’d expect a proper band. Most of the people will prefer the stainless steel model, with a metal or leather band, which will cost them at least €800. That’s more than an iPhone 6. Are you ready to pay for something you need to recharge at least once a day, keep out of water and dust, and think twice before you want to get it out? Hopefully not. My advice is to wait. Apple Watch nailed the customizations, notifications and the apps, but fails at protection, activity tracking, battery life, and pricing. Apple will eventually do things right, as it did with the iPhone 3G and iPhone 4. Just wait another year for the next-generation Apple Watch, which Apple is reportedly working on already. It will be a pity to spend €800 (or €10,000) or more for such a poor device and Apple replace it with a better one this fall, just six months after your purchase. It’s like getting a DVD rewinder in a hurry, prepping yourself for a new era, just to find out you don’t need this. Update: Following much controversy regarding the water resistance I’ve done some research, again, and as it turned out Apple stated the splash resistance on the Watch official page on March 10. Until then the Apple Watch was not advertised as a water-resistant device and this is the information I had at the time of writing this article – the very first days of March. Anyway, my statement is the same as the Watch is still not water-proof, just splash-resistant. Apple doesn’t recommend any submerging and you bet the warranty won’t cover any liquid damage. Are you still ready to risk water exposure of a €800+ piece of electronics? The opinions represented in this blogpost are solely my personal point of view and do not represent in any way the position of GSMArena.com or the editorial team in its entirety.